Coal-dependent China plans to generate at least 15 percent of its energy capacity from wind, solar and other renewable energy sources by 2020. Chief policy makers said they are revising earlier targets to create a "greener" environment, adding that new jobs to support the new energy sources also would spur economic growth. Xie Zhenhua, vice-minister in charge of climate change policy for the National Development and Reform Commission (NDRC), said last week that renewable energy is expected to account for 10 percent of the country's energy resources by 2010 and 15 percent by 2020. Zhang Xiaoqiang, the NDRC's vice-minister in charge of international cooperation, was more ambitious. 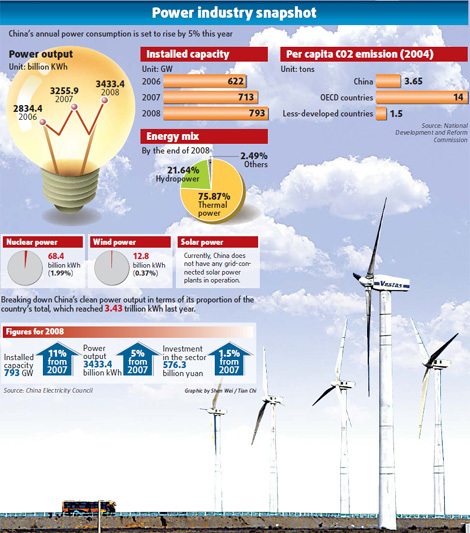 Zhang said recently that China could reach a renewable energy target of at least 18 percent by 2020. "Personally, I think we could reach the target of having renewable sources make up 20 percent of total energy consumption," Zhang recently told the media in London. Sun Qin, deputy director of the National Energy Administration, told China Business Weekly that China would soon announce the revised power supply capacity target for 2020 -- a target that might increase to 1,400 to 1,500 gigawatts, or gW, of energy. The revised target, if approved by the central government, would represent nearly a 50 percent increase from the previous goal set by the government in 2007. In 2007, the central government had approved plans to develop 1,000 gW in installed energy capacity by 2020. This year, China's power capacity will surpass 900 gW and will soon be on par with the United States, which now has 1,000 gW in energy-generating capacity. Zhang said China would restructure its electricity supply mix by supporting more investments in nuclear, solar, wind and biomass energy resources. In line with the revised target, the ratio of nuclear power to the combined installed electricity capacity would increase to 5 percent in 2020 -- up from 2 percent in 2008. Sun of the National Energy Administration said China's installed nuclear power capacity target would increase to 60 gW to 75 gW by 2020, up from the previous target of 40 gW approved two years ago. Sun did not discuss the specific 2020 targets for wind, solar and biomass power. On solar power, the NDRC's Energy Research Institute reported that China's 2020 target would be expanded from 1,800 megawatts (mW) of installed solar capacity established in 2007 to 10,000 mW or more. At the end of 2008, solar power capacity attached to the grid was less than 100 mW, or 0.01 percent, of China's installed capacity. Even with a tenfold increase in the 2020 target, solar energy would play a much smaller part in China's overall power mix than other energy sources. Under the 2007 plan, biomass and wind were set to reach a generating capacity of 30,000 mW by 2020, with nuclear power expected to reach 40,000 mW. Xiao Ziniu, director of the National Climate Center, said China's onshore wind power potential has been evaluated at 700 gW to 1,200 gW. China has another 250 gW of potential offshore wind power capacity, the center reported. Some regions have been identified as rich in potential wind power resources. For example, the Xinjiang Uygur autonomous region was estimated to have more than 100 gW of wind power generating potential. Plans are being considered to develop mega wind power farms with the potential to each generate more than 10 gW. "We have great renewable resources to explore," Xiao said.